Many who follow the e-reader market keep coming back to the same question: how long does it realistically have left? The explosion of tablets and reader apps for smartphones have left their respective impacts on the space, while the market for devoted readers continues to be dominated by Amazon's Kindle. Undaunted, both Kobo and Barnes & Noble launched new black and white e-readers based around the same touch and display technologies last week. After all, despite increased competition from outside the space, the reader market continues to be a vibrant one -- and after the Nook Color proved it was an undercover tablet all along, Barnes and Noble has hit back with this latest Nook as proof of its focus on one thing: reading. 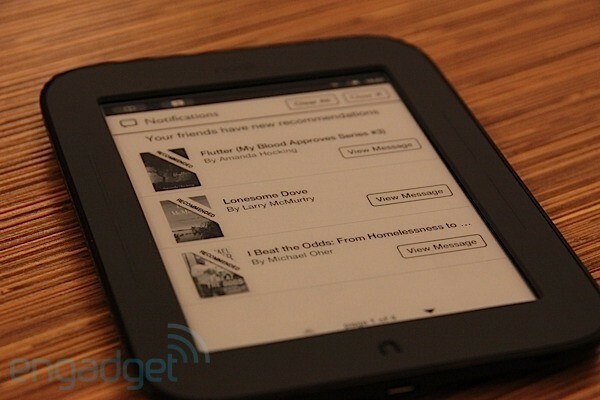 How would you rate the nook Simple Touch? The first thing you notice out of the box with the new Nook is just how nicely it fits in your hand -- this is a device that was built to be held. 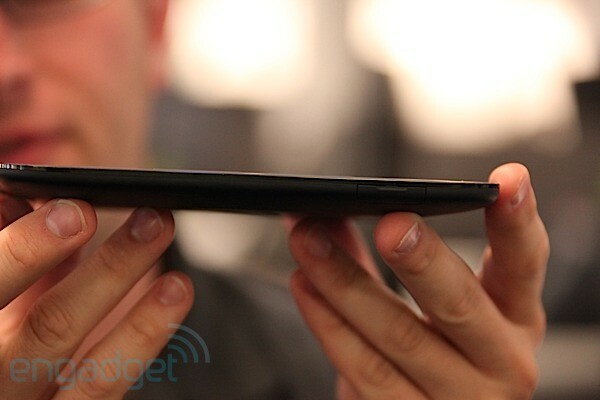 At 0.47 inches (11.9 mm), the Nook is a bit thicker than the latest version of the Kindle, though Barnes and Noble's reader has a concave back, with an indentation perfectly positioned for gripping. Otherwise, the 6.5 by five-inch (16.5 by 12.7 cm) reader is noticeably smaller than the Kindle, and while it's perhaps still too wide to share the "pocketsize" claim of the Kobo, the new footprint certainly brings a newfound holdability and portability to the reader. 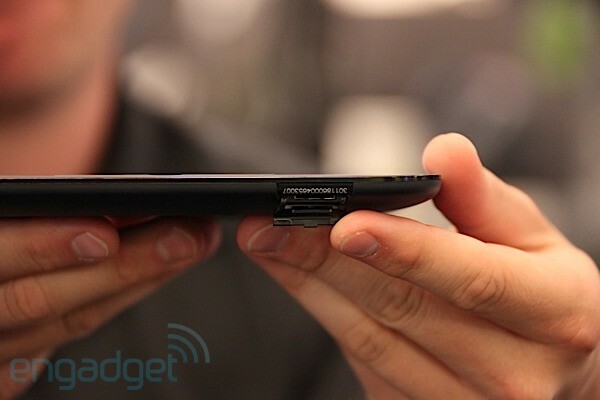 The new footprint is thanks, in part, to the device's lack of a physical keyboard. The Nook is all screen -- well, screen and bezel. It's certainly worth noting, of course, that Barnes & Noble's "one button" talk is grossly exaggerated. 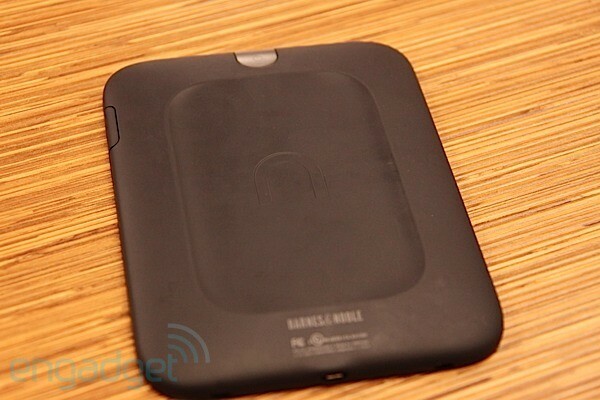 The issue has caused a deal of debate online, and when we met with the company to pick up the Nook it used the qualifier "essential" to describe the one button situation. The button in question is the "N" just below the screen, which supplements the touch interaction, popping up a toolbar at the bottom of the screen. There are actually six buttons in all, the "non-essentials" being the page forward and page back raised lines on either side of the screen and a fingerprint sized power button on the rear. The Nook has 2GB of storage built-in, double the Kobo and half the Kindle -- but both the Kobo and Nook offer a microSD card slot, which lets you expand them by up to a whopping 32GB. That, along with the company's cloud storage, should keep you reading for a while. As will the battery life -- we've seen some online squabbling about what Barnes & Noble and Amazon's respective claims of "two months" mean precisely, but it's safe to say you won't be worried about that battery bar on long business trips. Inside is a 800MHz TIOMAP 3 processor, zippier than the Kindle's 532MHz Freescale i.MX353, and page turns, startup, and PDF viewing all moved quite swiftly. 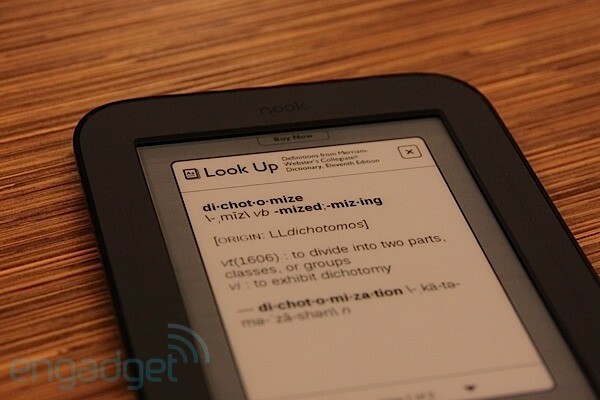 At present, this latest version of the Nook is WiFi only, a fact that may drive some users into Amazon's 3G-capable arms. WiFi, however, will likely prove enough for many if not most users, particularly with Barnes & Noble's massive infrastructure of brick and mortar locations with free wireless. 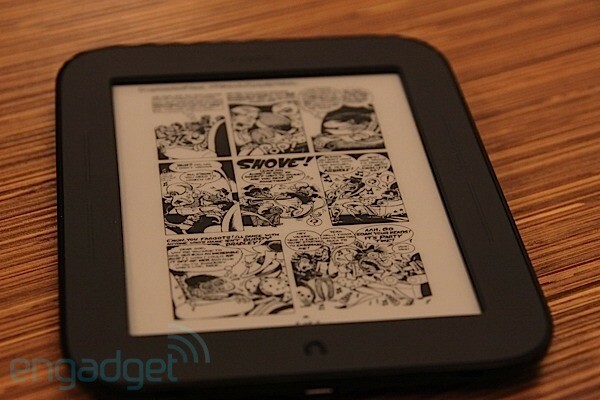 The introduction of Pearl E Ink marked a major step up in contrast over first-generation readers. It has since become the industry standard, with all the major players -- Amazon, Sony, and Kobo -- all offering at least one device with the technology. If you've played around with the latest Kindle you know what to expect here -- the device can't handle your comics or magazines like a Nook Color or iPad, but what it does it does well, with high contrast and clarity for black and white text and images. The page turn rate on the new Nook is quite swift, as well, beating out the third generation Kindle -- not by leaps and bounds, but the difference is certainly noticeable, helped along by the fact that the reader often only requires a full refresh every half-dozen pages or so. One of the major updates here is the addition of Neonode's zForce infrared touch experience, offering a touchscreen reading interface that promises to further blur the line between using an e-reader and an old timey book. Advancing pages is performed by dragging a finger across the screen and swiping in the opposite direction to go back-- the same can be accomplished by touching the margins. The infrared technology is built into the bezel of the device, rather than the screen itself, so contrast does not suffer. The zForce is quite responsive, advancing or scrolling with a light touch. The size of the device also allows for simple one-handed reading without having to rely on the bezel's buttons -- actually navigating through menus, however, will likely require two hands. Since the technology relies on infrared, you don't need your naked finger to do the touching -- it can be accomplished with a pen or a gloved hand when it's cold outside. 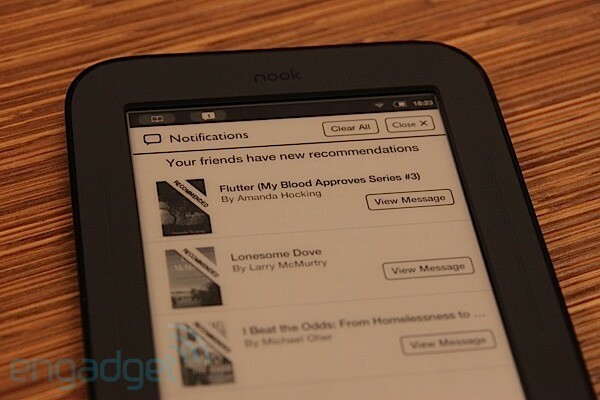 The center of the Nook's software experience is the home page, which is always a couple of taps away. The page shows you what page you're on, your three most recent downloads, and and a list of books that your friends are taking about. The toolbar along the top offers up battery life, time, WiFi strength, the number of new messages from your friends, and a book icon, which brings you back to your current reading selection. The page is most easily accessed by clicking the N button, which pops up a tool bar that also brings up the library, shopping, search, and settings. As no doubt expected from such a device, the reading experience itself is fairly straightforward, the screen monopolized by text, your progress displayed at the bottom. Clicking "Go To" in the toolbar lets you skip ahead quickly and shows you how far you are in your current chapter. The text is fairly customizable, with seven sizes, six styles, and three linespacing and margin options. Clicking "Publisher Defaults" will clear all of that out. Holding down the text brings up a highlight option, where the user can add notes, look up words with the built-in Merriam-Webster dictionary, and share passages with friends. The highlight feature is a bit tough to master with the infrared touchscreen, and attempting to share entire passages can be a bit maddening. Keep your sanity, however, you can share quotes with your friend list or via Facebook or Twitter. 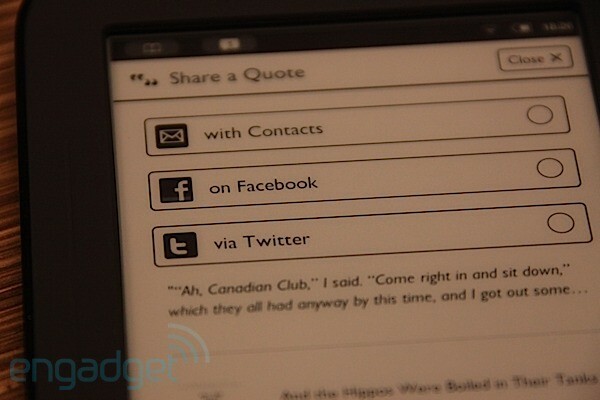 That's one of a handful of social features offered at the device. Such things may prove a distraction from the core reading mission for many, but Barnes & Noble compares the experience to being in a book group, leveraging the device's wireless technology to make reading a truly social undertaking. You can send recommendations to friends and lend books. Messages are sent using the on-screen virtual keyboard, which, like the highlighting feature, is not quite optimized for the device's current touchscreen. The built-in shop is straightforward, letting you search for books magazines, and newspapers or browse based on lists and Barnes & Noble recommendations based on past purchases. Buying a book just takes a couple clicks. Once downloaded, it will pop up in your library and on the home page. You can also drag content onto the device from your PC, ideal in the case of PDFs. After playing around with the Kobo's zooming and panning functionality, however, the Nook's limited PDF functionality is a bit of a disappointment. Also unfortunate is the fact that using the PDF was one of two times the device completely froze us on in a short period of time, requiring a full restart -- a big strike against the otherwise stable reader. The new Nook is a bit of an enigma, in a sense, simultaneously adding more features while attempting to return to the simple reading experience missing from tablets like the iPad and Nook Color. It succeeds on both accounts. All of the new features enhance rather than detract from the goal of reading, and they're there when you want them and mostly invisible when you don't. The social functions are about reading and reading alone -- if you're looking for a place to play Words with Friends, look elsewhere. The industry -- save for Sony -- has seemingly settled on a price point for simple e-readers, and at $139, the Nook fits right in, priced the same as the Kindle and $10 more than the 1GB Kobo. The reader is a little buggier than we'd hoped for-- outside of reading, the touch technology leaves a bit to be desired, and the freezing puts the overall stability a bit in question. 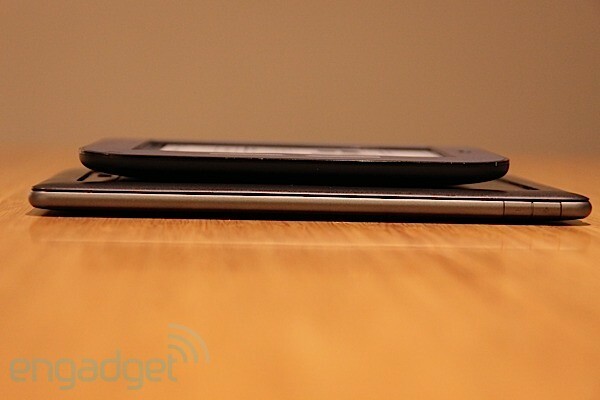 Beyond that, however, the Nook serves its main function quite well. This is a great device for just plain reading, and if sales are any indication, there are still plenty of people who want to do just that.